Enjoy the best inspirational, motivational, positive, funny and famous quotes by Armin Mohler. Use words and picture quotations to push forward and inspire you keep going in life! 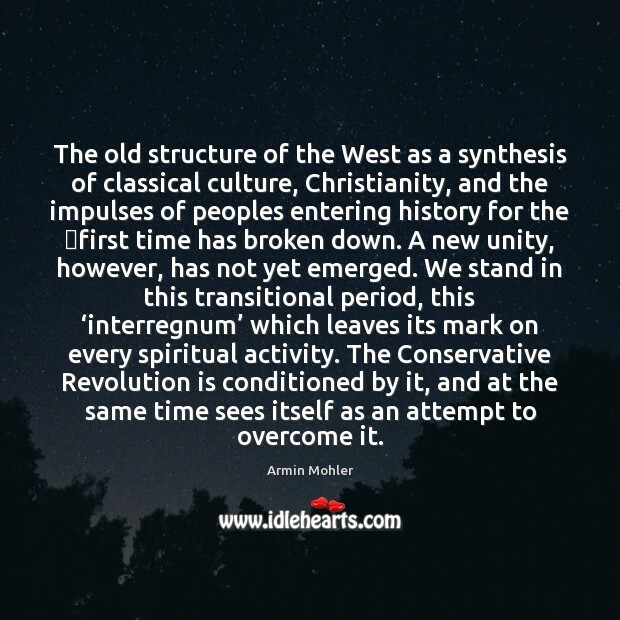 The old structure of the West as a synthesis of classical culture, Christianity, and the impulses of peoples entering history for the first time has broken down. A new unity, however, has not yet emerged. We stand in this transitional period, this ‘interregnum’ which leaves its mark on every spiritual activity. The Conservative Revolution is conditioned by it, and at the same time sees itself as an attempt to overcome it.